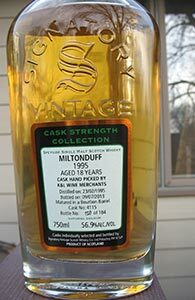 And after yesterday’s 23 yo Miltonduff here is an even older one. 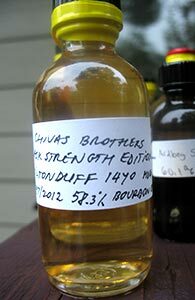 This one is stated as being from a sherry cask. It was bottled by Maltbarn and I’m hoping it is better than their Glenrothes 1990 that I reviewed last week. With a 63 bottle outturn the cask was obviously split with someone else. Let’s get right to it. Nose: Not much evidence of sherry, at first anyway. Instead there’s some musky fruit with hints of gasoline and some creamy vanilla. No real development. And not with water either. Another malt from the not-very beloved Miltonduff. I’ve quite liked the two I’ve reviewed so far (here and here). This is my first from a sherry cask (see below) and also the oldest I’ve had so far (though that mark will not last long). This was bottled by Riegger’s Selection, a German store and indie bottler of whom I know very little. As far as I can tell from their website they have some sort of connection to the Speyside distillery and select from the same warehouses as the Scott’s Selection line which originates in that distillery. 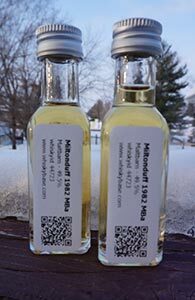 Well, as my first Miltonduff was pretty good I figured I’d open a recently purchased independent bottling and taste a bit right after so as to make a direct comparison to an official bottle. This one is in Signatory’s Cask Strength Collection and is a single cask selected by K&L in California. I’ve generally liked all the K&L selections I’ve had in the last few years so I’m optimistic. Miltonduff is in the Speyside and is one of Chivas Bros.’ workhorse distilleries, producing mostly for blends–in particular for the very popular Ballantine’s*. I don’t think there are very many official releases around of the single malt, and a lot of what has been put out by the indies has got it a spotty reputation. This particular release is from Chivas Bros.’ series of limited edition 500 ml cask strength bottles that are theoretically meant to be available at the distilleries only–at least that was the case when the series was inaugurated, I believe. There have been releases in this line from Glenlivet, Longmorn and Glenburgie among others, and they’ve generally been very well reviewed. 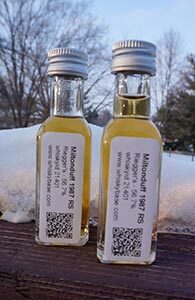 As I’ve never had anything from Miltonduff before I’m hoping this means that my introduction to this distillery is going to be a good one.